Posted by Jon in Marvel Legends, Review with 4 comments. Well, they are finally here! 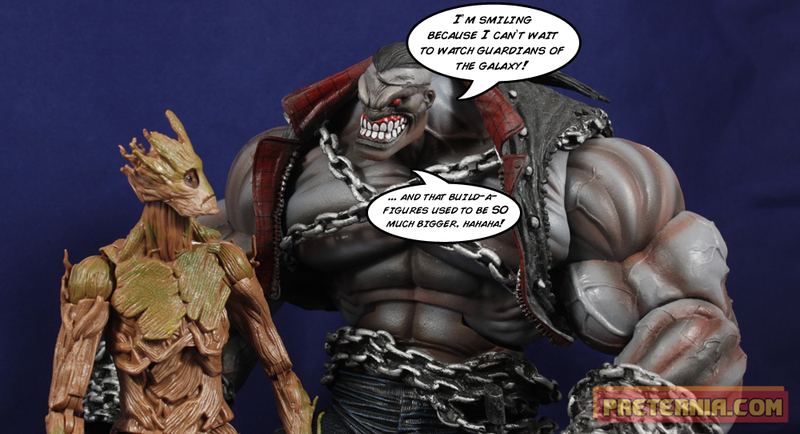 The Guardians of the Galaxy movie gets its own wave of Marvel Legends figures complete with a build-a-figure of tonight’s review subject: Groot. For an untested property I’m actually surprised at how much merchandise they have planned for this movie. There is a Marvel Legends wave, a line of ships accompanied by two-inch pilots, and of course the various masks and role-play items. Guardians of the Galaxy certainly isn’t a household name, so I’m glad to see the push of faith and I hope the movie ends up being good. I also hope that if it is good it actually connects with a general audience, because if it doesn’t we can expect safe Disney to be in full effect going forward with future movies. Much like all of the Marvel movies this year GotG gets a Marvel Legends themed wave. In general these waves have contained a nice mix of both movie and comic based figures. The main cast of the movie is covered with Star-Lord, Gamora, Drax, Rocket Raccoon, and Groot. Surprisingly they did not do any of the main cast in comic form for this wave, but we do have Nova (which was a much-needed redo) and Iron Man. 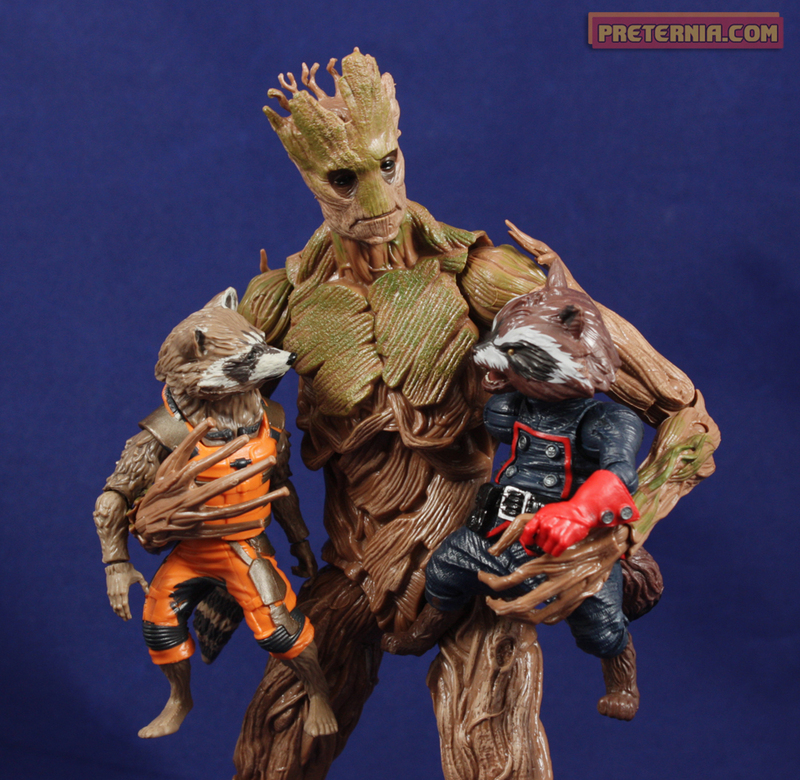 If you are looking to get the comic versions of the cast thus far Rocket Raccoon came as a BAF last year, Drax was a single release about two to three years ago now, and Star-Lord is finally coming out in a SDCC box set this year. 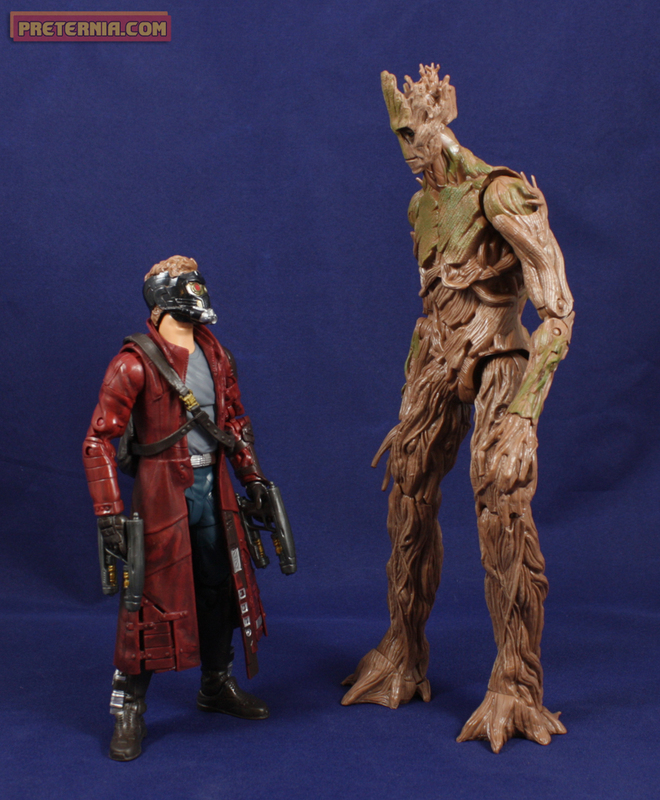 Even if you aren’t into the movie designs I think one of the biggest draws of owning this set is building Groot. His movie design isn’t a complete departure from the comic look, so he can be a servicable stand-in for your comic display as well if you choose. Do I expect to see a comic version of Groot? I suppose anything is possible, but we were also supposed to have the Wrecking Crew complete by now. Maybe when Guardians of the Galaxy 2 hits we’ll have ourselves some nice comic versions of the Legends, similar to what they did with the second Captain America film. 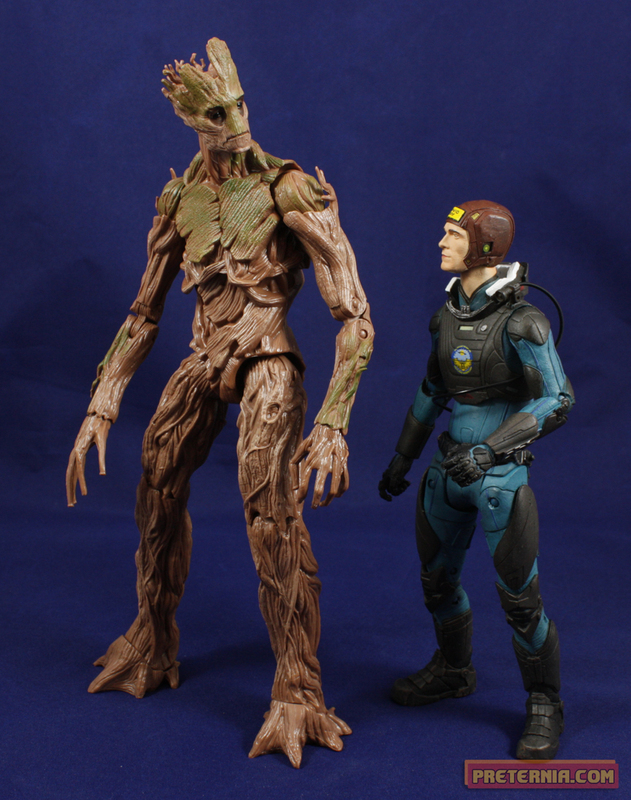 Groot is a good-looking figure who literally stands above the other figures in the series. He measures up to about nine inches in height! The sculpt is pretty strong, but I do have a nitpick on one of the articulation choices. Where on earth are the ball hips? If not ball hips at least even an upper thigh cut? The guy is made of jagged bark so it would have been a very easy joint to cover up as well. Past that he has the basic Marvel Legends articulation which works fine for him. I wouldn’t mind having an alternate pair of hands though … too much to ask? Actually an angry alternate head would be good too! 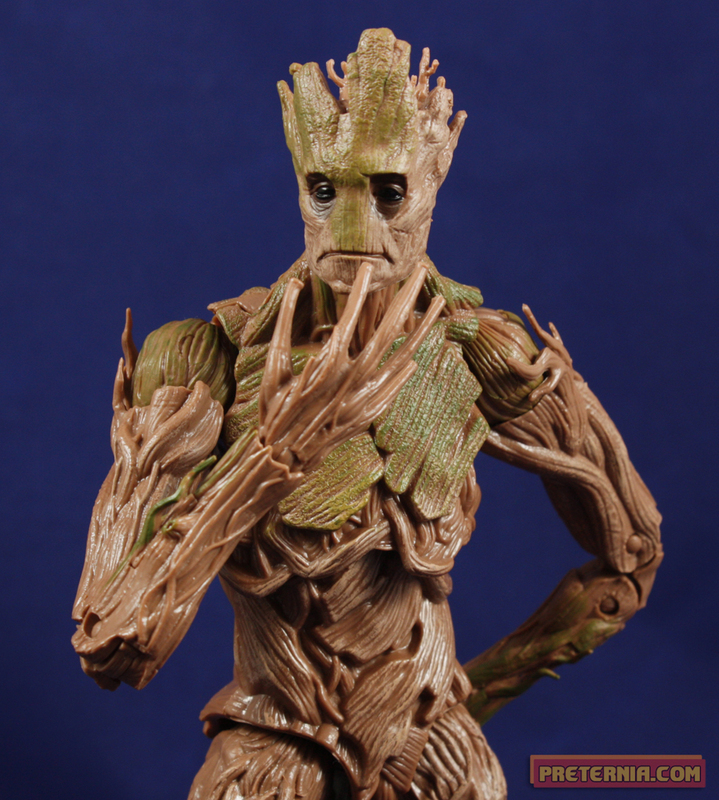 I’ll probably have to wait for the Figuarts Groot before I get all of that. Despite wanting an extra head for Groot I am, in fact, quite pleased with the one we got. It’s a great likeness, and as I get into the details of the rest of this wave it will become more clear that likeness is not always guaranteed. The face along with the rest of the body have some nice brown and green shading. It captures a mossy wood look that I assume they were going for. The big question with any “build-a-figure” is if it that figure is worth buying six other figures to get? The Guardians of the Galaxy Marvel Legends wave run about $20 per figure and you need all six to complete him. I like him quite a bit. He’s also the logical build-a-figure to go with a GotG themed wave. 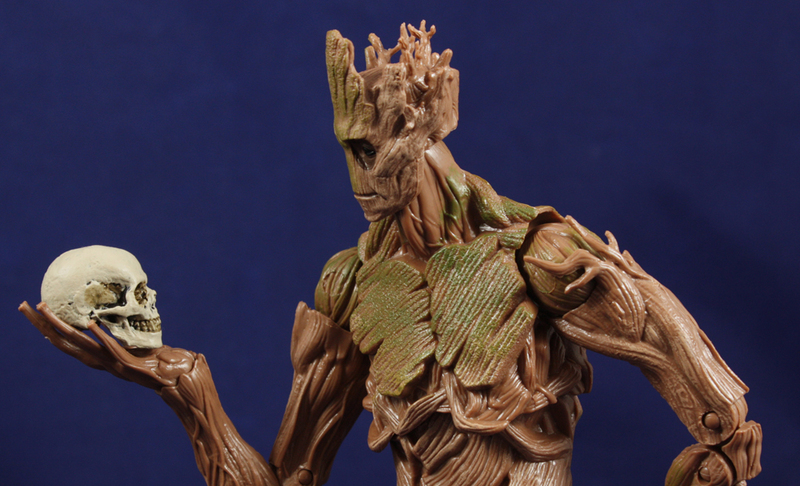 If you want a Groot I’d say the set is worth investing in. Besides the Iron Man and Nova the rest of the wave is the core of the team, and Nova can be considered an apology figure for the mess they previously produced. Most of the figures can be had for around $20 if you head on over to Amazon.